Humanity exists in a hyperconnected world, where our closest friends, loves, and enemies lie but a keyboard stroke away. Few know this better than the poets who have risen to the top of their trade by sharing their emotion, opinion, and art with millions of fans. 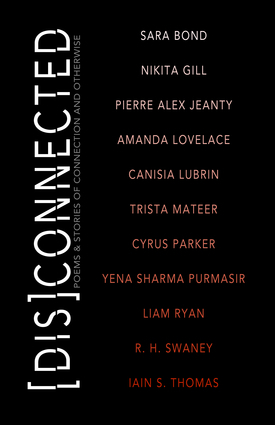 Combining the poetic forces of some of today's most popular confessional poets, this book presents poems and short stories about connection wrapped up in a most unique exercise in creative writing. Follow along as these poets connect with each other—offering their poetry to one of their fellow contributors, who tells a story based on the concept presented to them. With poetry, stories, and art, [Dis]Connected is a mixed media presentation of connection, isolation, love, and loneliness. By bringing together some of the most popular contemporary poets, Michelle Halket has created a compilation which exemplifies the reasons behind the popularity of short fiction. Michelle is the managing editor and publisher of Central Avenue. Contributors to this volume include Sara Bond, Nikita Gill, Pierre Alex Jeanty, Amanda Lovelace, Canisia Lubrin, Trista Mateer, Cyrus Parker, Yena Sharma Purmasir, Liam Ryan, R. H. Swaney, and Iain S. Thomas.